There is a very lively body of work emerging in the intersection between computational mathematics and various fields of the social sciences. This emerging synergy between advanced computational mathematics and the social sciences is possible, in part, because of the way that social phenomena emerge from the actions and thoughts of individual actors in relationship to each other. This is what allows us to join mathematics to methodology and explanation. Essentially we can think of the upward strut of Coleman’s boat — the part of the story that has to do with the “aggregation dynamics” of a set of actors — and can try to create models that can serve to simulate the effects of these actions and interactions. Large dense crowds show aggregate behavior with reduced individual freedom of movement. We present a novel, scalable approach for simulating such crowds, using a dual representation both as discrete agents and as a single continuous system. In the continuous setting, we introduce a novel variational constraint called unilateral incompressibility, to model the large-scale behavior of the crowd, and accelerate inter-agent collision avoidance in dense scenarios. This approach makes it possible to simulate very large, dense crowds composed of up to a hundred thousand agents at near- interactive rates on desktop computers. Or in other words, the task of analysis is to provide a testable model that can account for the way the behaviors and interactions at the individual level can aggregate to the observed patterns at the macro level. Another more extensive example of work in this area is Gianluca Manzo, Analytical Sociology: Actions and Networks. Manzo’s volume proceeds from the perspective of analytical sociology and agent-based models. Manzo provides a very useful introduction to the approach, and Peter Hedstrom and Petri Ylikoski extend the introduction to the field with a chapter examining the role of rational-choice theory within this approach. The remainder of the volume takes the form of essays by more than a dozen sociologists who have used the approach to probe and explain specific kinds of social phenomena. 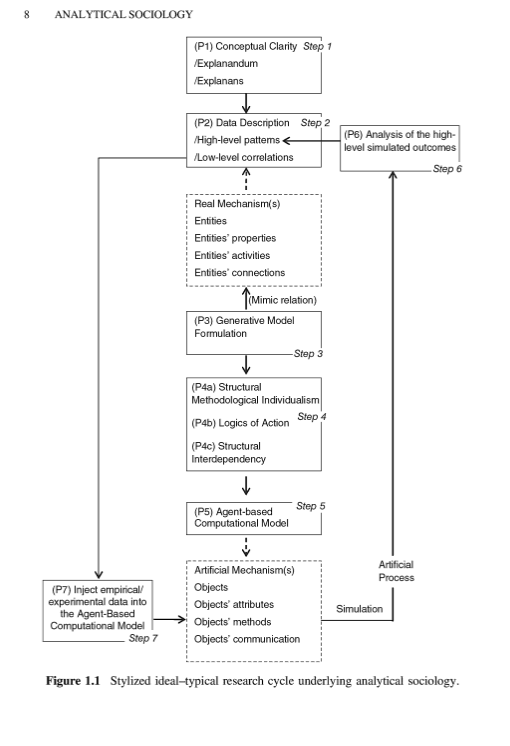 So agent-based modeling simulations are a crucial part of Manzo’s understanding of the logic of analytical sociology. As agent-based modelers sometimes put the point, “you haven’t explained a phenomenon until you’ve shown how it works on the basis of a detailed ABM.” But the ABM is not the sole focus of sociological research, on Manzo’s approach. Rather, Manzo points out that there are distinct sets of questions that need to be investigated: how do the actors make their choices? What are the structural constraints within which the actors exist? What kinds of interactions and relations exist among the actors? Answers to all these kinds of question are needed if we are to be able to design realistic and illuminating agent-based models of concrete phenomena. Here is Manzo’s summary table of the research cycle (8). And he suggests that each segment of this representation warrants a specific kind of analysis and simulation. 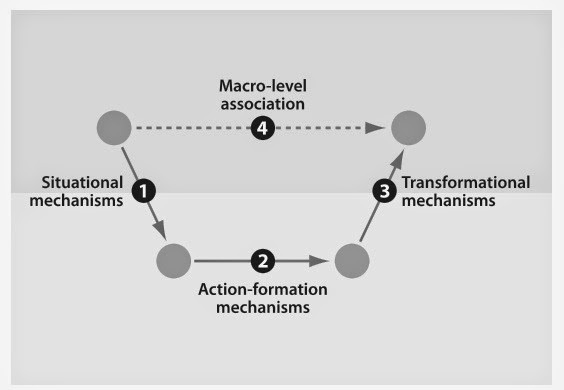 This elaborate diagram indicates that there are different locations within a complex social phenomenon where different kinds of analysis and models are needed. (In this respect the approach Manzo presents parallels the idea of structuring research methodology around the zones of activity singled out by the idea of methodological localism; link.) This is methodologically useful, because it emphasizes to the researcher that there are quite a few different kinds of questions that need to be addressed in order to successfully explain a give domain of phenomena. The content-specific essays in the volume focus on one or another of the elements of this description of methodology. For example, Per-Olof Wikstrom offers a “situational action theory” account of criminal behavior; this definition of research focuses on the “Logics of Action” principle 4b. Wikstrom attempts to apply these ideas by using a causal model to reproduce crime hotspots based on situational factors (90). The contribution of Gonzalez-Bailon et al, “Online networks and the diffusion of protest,” focuses on the “Structural Interdependency” principle 4c. Their contribution attempts to provide a basis for capturing the processes of diffusion that are common to a wide variety of types of social behavior, based on formal analysis of interpersonal networks. They demonstrate that the structure of the local network matters for the diffusion of an action and the activation of individual actors. In short, Analytical Sociology: Actions and Networks illustrates a number of points of intersection between computational mathematics, simulation systems, and concrete sociological research. This is a very useful effort as social scientists attempt to bring more complex modeling tools to bear on concrete social phenomena. « A sense of injustice in China?